Things to know: don’t put the batter into the squeeze bottle until you’re ready to cook, the batter may well ooze up and out of the bottle. The butter amount is unspecified as it depends on whether you are going to serve the poffertjes in the traditional manner, brushed with melted butter and showered with icing (confectioners) sugar, or if you will go with my serving alternatives. Just as with making regular pancakes, you’ll need to adjust the heat of the pan to get an even colour on the poffertjes. Whisk the flour, buckwheat flour and salt together in a medium sized bowl. 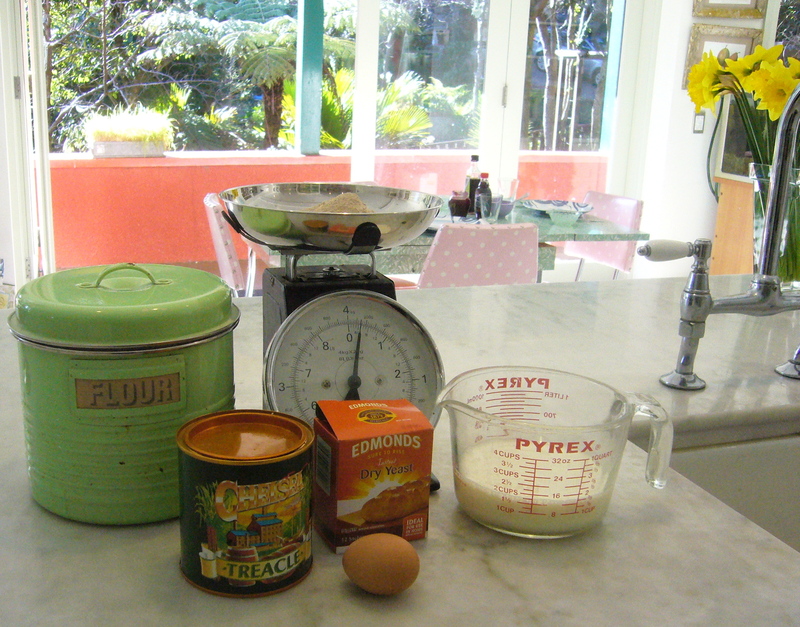 Sprinkle the yeast into the warm milk, and whisk the treacle and egg into the milk also. Pour the liquid into the dry ingredients, and stir until smooth. Don’t worry about overmixing, as the buckwheat has very little gluten. Go and have a coffee and read the Sunday paper for about 40 minutes. Pour the batter into a squeeze bottle with a nozzle cap. Don’t worry about deflating the batter. It’ll be quite lively by now, and will recover its oomph quickly. 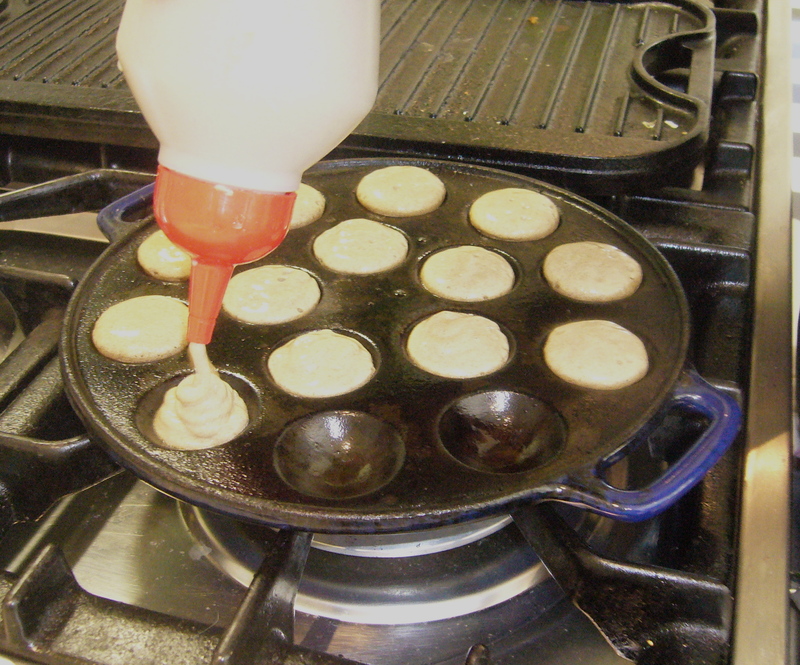 Heat a pofferjtes pan or a heavy fry pan over medium heat and brush with melted butter. 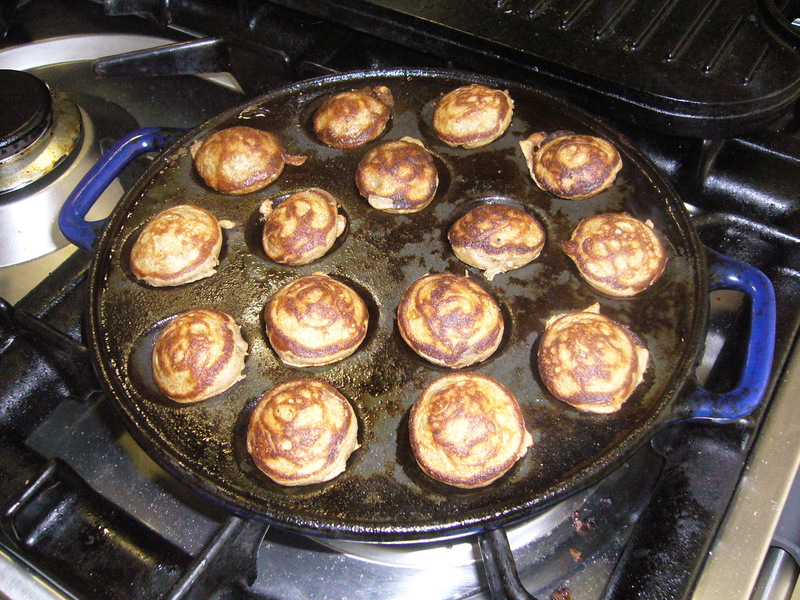 If using poffertjes pan, squeeze enough batter to fill the dimples in the pan, otherwise make coat-button size dots of batter in the fry pan. When small bubbles appear on the surface, flip the poffertjes. I use a spoon and fork combo, but I can’t deny that it takes a bit of skill and practice to get the poffertjes over and neatly back into the depressions in the pan. Flip them out when they are nicely browned, and eat immediately. 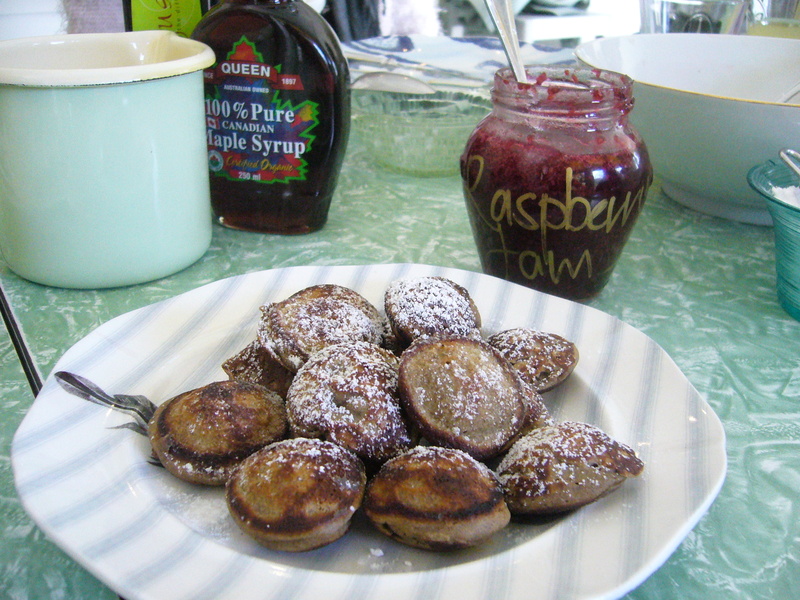 I’ve mentioned the Dutch way of serving poffertjes, but some delicious alternatives are dipping them in a puddle of jam, dousing them in maple syrup, or my daughter Emily’s favourite, sweet apple syrup and a sprinkle of cinnamon sugar. Karen hasn’t mentioned that she also drowns these in PLENTY of melted pure NZ butter, which is just one more way that she makes them so delicious (and naughty!, best enjoyed seated at Karen’s kitchen table with your special china plate piled high and sharing the apple syrup and cinnamon sugar with Emily – there’s always plenty and this is a most generous household! Jo, that’s such a kind comment. You can’t beat hot butter and apple syrup. pure yum! My good friend Ingrid.. tells me that these were a great favourite in her homeland South Africa….. sound great…. Thanks for sharing; these look fairly simply to make (and delicious). I may attempt them I’m not running around with the grandkids this weekend! They’ve been asking me for coffee cake and my husband usually orders New York style crumb cake right online. I may told him to hold off and give these poffertjes a whirl. I made this recipe with “Bob’s red mill, whole grain buckwheat flour”, and they came out very dark and too whole wheaty.. Where do you buy buckwheat flour without the hul in the United States? could you please let me know where you got your poffertjie pan from? I am looking for a cast iron one to give as a gift.